According to the Historical Marker on the grounds, pioneers probably began using this graveyard during the 1860s. The earliest marked grave is that of Elizabeth White Bobo (1866-1871), whose parents came to Texas in 1870 from Bedford County, Tenn. In 1877 Milton Moore deeded a five-acre tract, including this cemetery, to New Hope Church of Christ, now Bedford Church of Christ. The Bedford Church Old Settlers Reunion met here annually for over 50 years. W. L. Hurst (1833-1922), for whom nearby Hurst is named, is interred here. 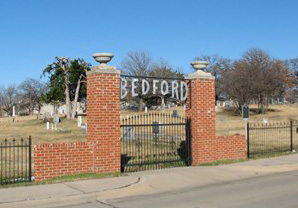 In 1975 the Bedford Cemetery Association acquired the site. Many Bedford pioneers are buried here in unmarked graves.